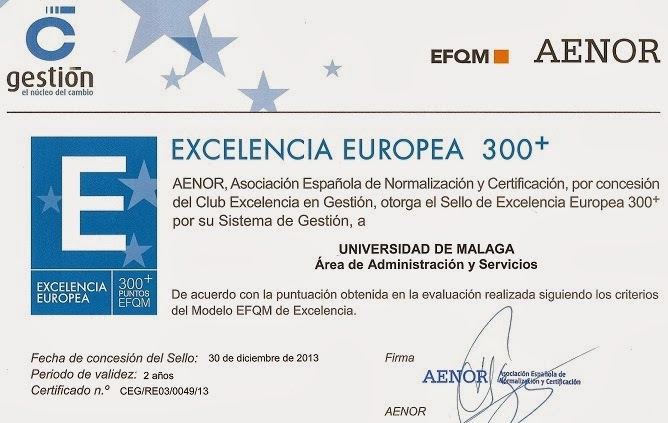 UMA's OTRI, highly committed to service and process improvement to satisfy customers, has developed and implemented a quality management system, which was the first in Andalusia to be certified by the Spanish Association of Standardisation and Certification (AENOR), having met the requirements stated in Norm UNE-EN ISO 9001:2008. OTRI also wished to highlight its commitment to the environment by setting up the Office of “Environmental Management System” certified under ISO 14001:2004 by AENOR. These certificates for quality and the environment have helped UMA's OTRI consolidate a serious and quality image in the research and business domains while preserving the environment. /cms/secciones/ajax/insertar_seccion/ /cms/secciones/ajax/borrar_seccion/ /cms/secciones/ajax/editar_seccion/ /cms/secciones/ajax/mover_seccion/ Are you sure you want to delete this section? 4937 You are about to cancel the edition. All your changes will be lost. Do you want to cancel and lost your changes?